The rain poured down during the morning. Over 10mm in an hour or so. I checked the met website which has been fairly accurate to date and they predicted after 8am it would ease off and fine up into a nice day. A few other trampers decided the rain was too much but I was confident in the prediction. So I had a bit of a sleep in (until 7:30) and was ready to hit the road by 9am. While I started with my rain jacket on and there was a light drizzle, the big rains had gone and by the time I got into Central Hamilton, the rain had all but disappeared and the jacket came off. The trail took me right into the heart of Hamilton and follows a route through a shopping centre. Given it was Sunday most shops were shut as they open at 10am. Not to worry, I didn’t need anything and do not need to be carrying any more weight. I have everything I need strapped to my back. The trail then follows around the Rotora Lake for a short distance. It was at the turn off from the lake back into housing areas that I met Jurgan from Germany. He was standing on the corner reviewing his GPS. Introductions over it was decided we would walk together for the day. For 24km the walking was fairly easy. Following roads through housing areas and into a walk-cycle way for a couple of kilometres took us through the Totora Arboretum. Just before the arboretum I clocked up 800 kilometres into this trip. For Jurgan it was 200 as he has travelled from Auckland. The arboretum was A lovely park with mature plant specimens from around the world and shaded tracks that meandered between small brooks. There were plenty of chickens and rosters about. I’m assuming they just roam free through the park. Coming into a stand of familiar blue gums the smell of eucalyptus in the air was sweet and put me back home for a moment. We took a short break here and continued on. Our paces matched really well and it was good to be walking and talking with someone for a change. I like walking alone as you set your own rules; break times, toilet stops or just take 5 to chill in a nice spot and absorb the world; but it was good to break this up a bit and walk with someone else. Besides, with my attitude of saying yes on this trip, I couldn’t really refuse to say no to the request to walk together. From the arboretum it was onto a few country back roads, into paddocks for a good distance, more backroads and a few short sections on more main roads/highways. We set a cracking pace and found a place to stop in the shade for lunch at Whatawhata (thats pronounced farta farta). And just after picking up packs and walking 5 minutes we found a cafe. Of course we had to spot for coffee, these things are compulsory given the days between good cups of brew. I miss my Fab coffee and caramel slice. From there it was back onto a main road for a few kilometres with not a lot of walking room but the traffic was good and would pull right out where they could. Following the trail directions and notes we soon found ourselves in a corn field. We weren’t sure this was the right way to go but both my maps and Jurgan’s GPS confirmed it was. It was easy walking through the rows of head high corn but I kept expecting to hear the crack of a gun over our heads from a farmer if they they spied the two heads and packs bobbing up and down through the corn – it never came, phew!!! But we were in the right location as at the end of the corn field we came across the standard orange directional marker confirming we were on track. 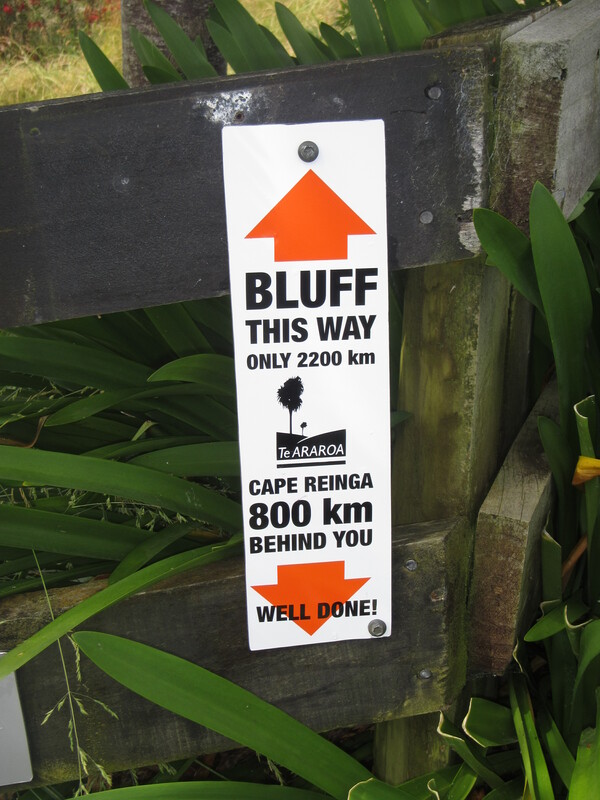 It was only then another 2km to the Karamu Lodge on Old Mountain Road. A good distance covered for the day at 24km and set up nicely for possibly a big climb tomorrow onto Pirongia. 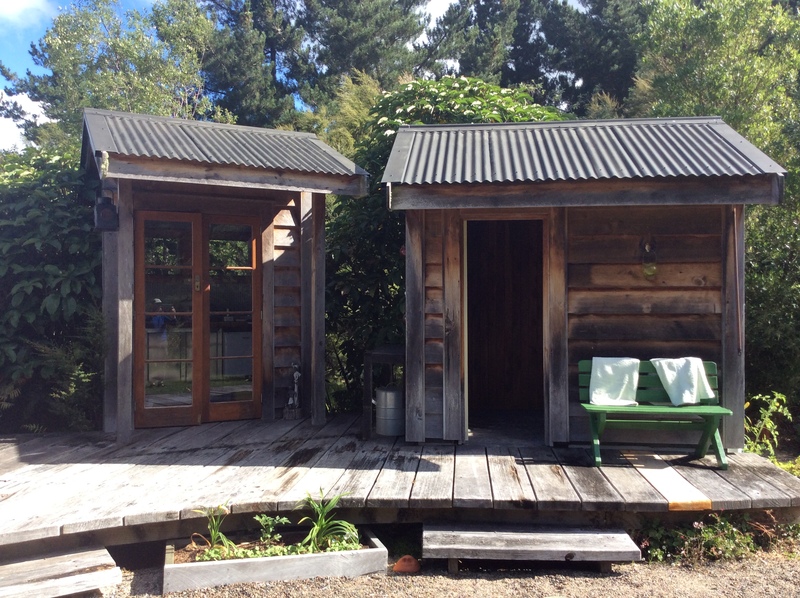 We managed to score some space in the back yard of the lodge for the evening with a mini kitchen and bathroom and towels surplied. The ambience surrounding this place is awesome and provides a great spot to rest for the night. A nice little retreat from the hustle and bustle I’ll have to remember if ever back in the Hamilton area. It looks like you will be in Waitomo very soon. You should definitely join the tourist crowds and have a crack at black water rafting. It’s pretty fun.